Living on campus is a ‘once in a lifetime opportunity,’ but with an overflow of residents and roommate disagreements, it can cause unnecessary anxiety for students. Brandi Guenther, a first-year nursing major, will be living in an apartment off-campus next year because she said her health is more important than following housing requirements. Traditionally, students are required to live in on-campus housing for their first and second year at South Dakota institutions. Students, like Guenther, can file for housing exemptions if their parents’ home is within a 60-mile radius from the school. 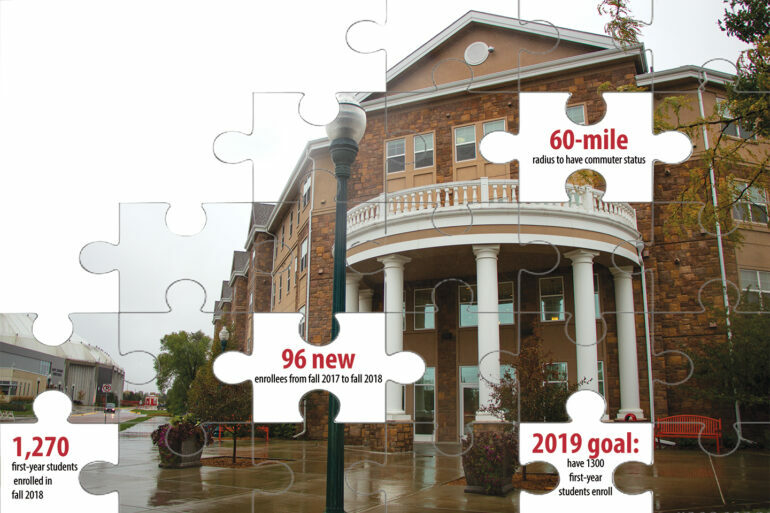 Cody Burggraff, Assistant Director of University Housing, said 60 miles has been the requirement since he started in housing and there is little chance of it changing in the future. The 2018-19 freshmen class saw an increase in enrollment by 6.4 percent from the previous freshmen class, a jump of 96 students enroll. In the next two years, the university plans to continue growing the number of students enrolling by 30 in 2019 and 26 in 2020. USD accepted 3257 first-year students in 2018, and only 1270 actually enrolled. Next year the university hopes to increase the acceptance by 129 students and 67 students in 2020. Although another increase is anticipated in class size, housing is not currently concerned with on-campus dorms for next year. Part of the preparation housing has done is transition 36 rooms in Brookman hall from single to double rooms. Burgaff said the building was designed as double rooms so it won’t be a challenging transition. Other dorms traditionally reserved for upperclassmen–Burgess and Norton–have had their first floors designated for potential freshman overflow. This year, the size of the freshman class forced students into lounges and didn’t move into dorms until the second semester. Guenther said although she was lucky enough to get a room, she had friends who lived in lounges and they said it was challenging to feel like they were actually in college. “(My friend) barely had a discount with her housing payment, and I think it’s really disappointing honestly. She said her college experience didn’t even start until she moved into a dorm room her second semester,” Guenther said. Nybol Kur, a first-year nursing major, lived in a lounge with three other girls through the fall 2018 semester. She said not knowing when they would be moved caused a lot of stress among the four of them. Kur said her situation wasn’t what she was expecting, but she said she thinks housing handled the overflow as best as they could. Although she said her year on campus was enjoyable, one year was enough, Guenther said. Occupancy is always challenging, Burgaff said, because it’s a moving target.